Simple, lovely and not over the top.With these elegant Calla Lilies dancingamong the pink spray of roses would makea beautiful little gift, and sure to cheer upany day.Vase is not included however; for a lastingimpression we recommend a Superior Vasewhich is the ideal selection for this gift. Order was delivered on time and recipient was happy. I did not see flowers. It was amazing !!! We live in Brazil and my daughter has been studying in Sidney. She didn't expected to receive flowers from us and suddenly received a big surprise !! Of course she cried a lot. Thanks for the excellence of your job . 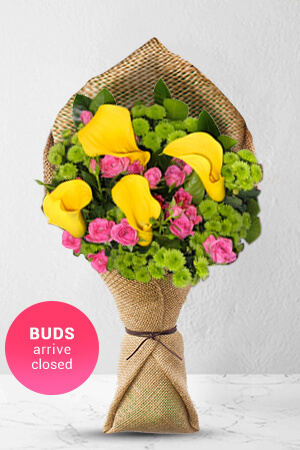 Stress-free ordering system, delivery was on time and the quality of the flowers, I am told, was high. I haven't actually viewed the flowers delivered but the process and service has been wonderful. Many thanks for such a great service.